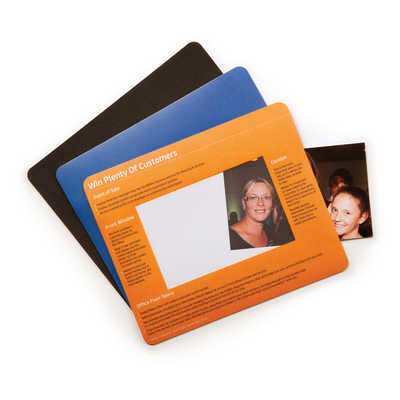 Everybody loves the Photo Frame mouse mat, put family photos, messages, matrix`s or any other reminders under the clear textured window. Various sizes and window areas available. Price includes one design only. Poly bagging add $0.25(G) per unit. Variable-data printing (VDP) (Also known as variable-information printing (VIP) or VI) is a form of digital printing, including on-demand printing, in which elements such as text, graphics and images may be changed from one printed piece to the next, without stopping or slowing down the printing process and using information from a database or external file. For example, a set of labels, each with the same basic layout, can be printed with a different name on each label. Variable data printing is mainly used for direct marketing, customer relationship management, advertising, invoicing and applying addressing on selfmailers, brochures or postcard campaigns. Colours: 4 Colour Process, Dimension: 230mm x 190mm x 1mm Natural Rubber. Price includes : 7-10 Day Service 4 Colour Process - One Location. Setup is included.